Ben Connell has taken up a 3 month studio residence at Array, developing an ongoing interest in design and environments through an exploration of aesthetics relating to abstraction. 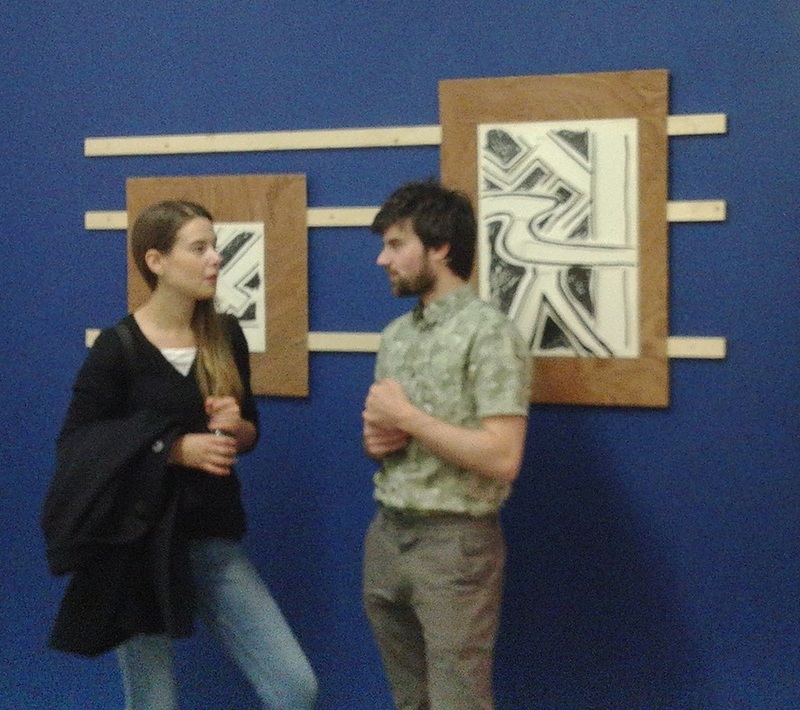 The body of work Connell will present at Free Quotes crosses over various media including sculpture, drawing and painting, focusing on material forms and reference to design history. 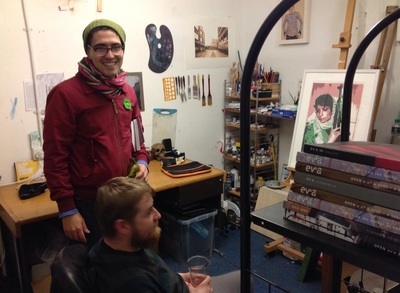 Connell studied Fine Art (BA) at Sheffield Hallam University and will begin a two year MFA at Trondheim Academy of Fine Art in autumn to further develop his study of art experimentation with design. A series of Bi-monthly themed events will be held in Array Studios throughout the year entitled Arraybeing Nights. Coinciding with The Sunday Salons, every other month will see a varied themed event held in the studio and centered around a screening. 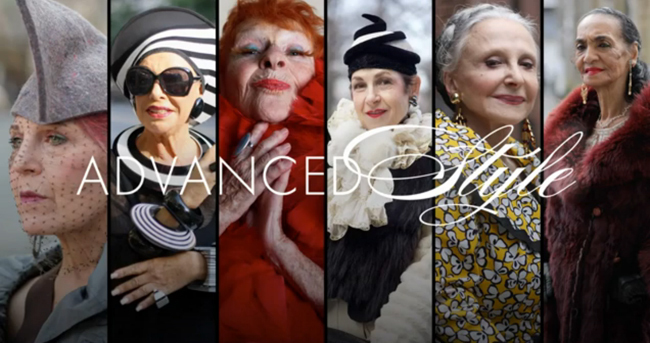 The first of these events will entail a screening of the documentary Advanced Style, an expose examining the lives of seven unique New Yorkers whose eclectic personal style and vital spirit have guided their approach to aging. There will also be a guest speaker from the fashion department of Ulster Musuem , sharing experiences of style, history and costume. Other themes will include American road movies, the art of the stand-up comic and watching shorts in shorts. 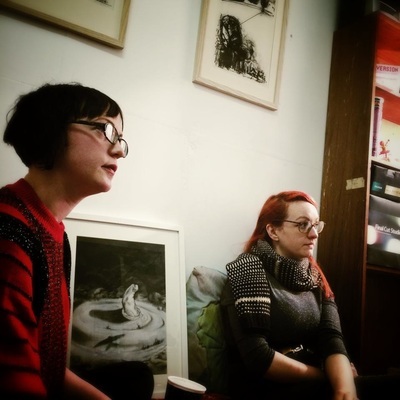 Motivated by the intention to expand Array Studio’s audience beyond an already familiar art community, ArrayBeing Nights is an effort to enhance communication between Array Studios and the public, raising awareness and visitor numbers to the studio group. 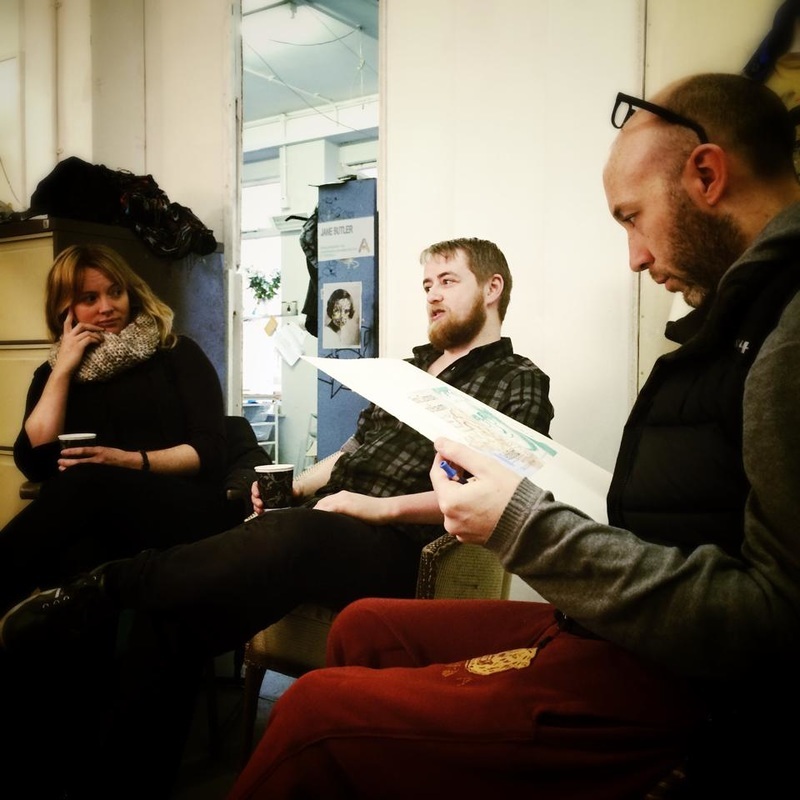 The Sunday Salon came about from a number of changes happening at Array Studios, and also my need as a studio group member to create some kind of happening that would bring a group of artists together. 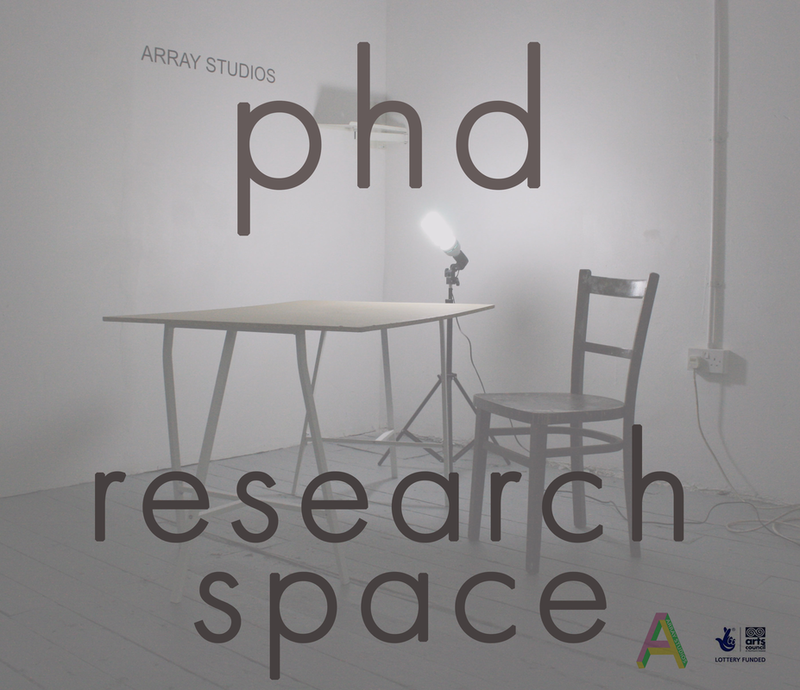 As a perpetual student (currently a PhD candidate at University of Ulster), and someone who enjoys a good conversation/debate/knowledge sharing activity I thought I could utilise the inCube space at Array for my Sunday Salon. The idea of the Salon came from my ongoing interest in the life and work of Louise Bourgeois, and her Sunday ritual of inviting artists to her New York apartment to partake in a Salon. 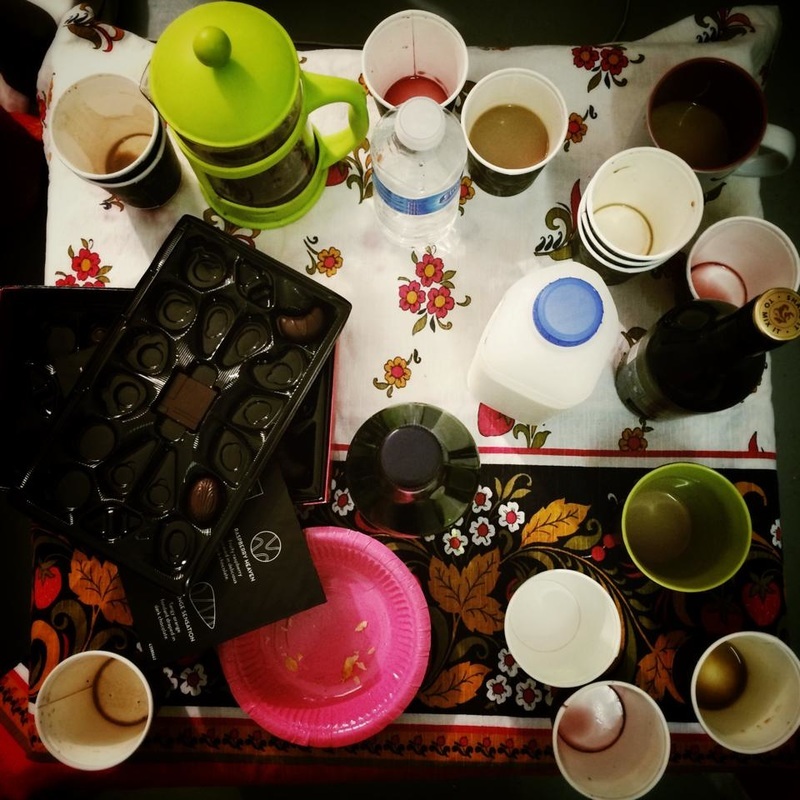 Artists were required to bring a piece of their work to discuss and drink was provided. Every week was a different group and from reading testimonials some salons got quite heated, the dynamic never being the same. So with this in mind I made a call out on Facebook inviting anyone who wanted to come along, unlike Bourgeois I was not bothered if not everyone had work to show, this being the first gathering and all. The ethos of the Salon, in my view, is that it is a place for artists to come together and share information, experiences, introduce concepts and get feedback on ideas or works in progress. It could be seen as an informal crit, for those ex-art schoolers with crit memories. The first Salon was on 14th of September at 3pm, there was no end time arranged as I wanted it to flow naturally and not be tied down to finishing at a certain time, also, there’s not much else to do in Belfast on a Sunday evening so there was no panic on anyone!! Guests were also encouraged to bring a tipple of their choice, sometimes it helps with getting ideas out, at least that’s what we think!! 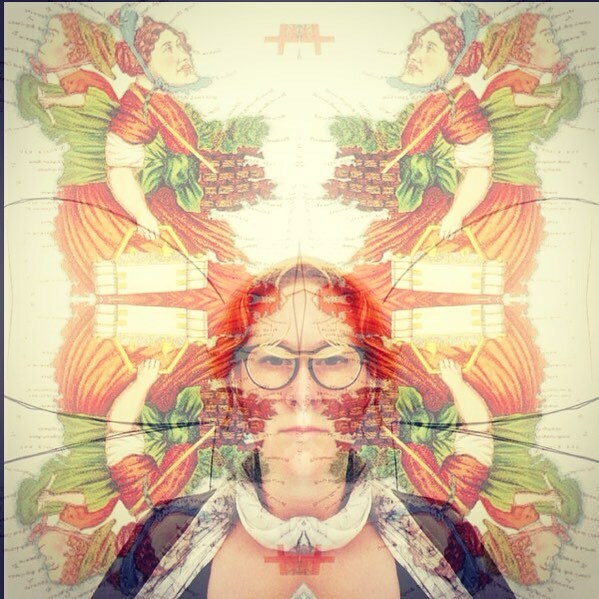 Starting off was slightly difficult but our brave studio member and admin-queen Jane Butler broke the ice, talking about her work explaining some ideas she was playing with and how her work is progressing. 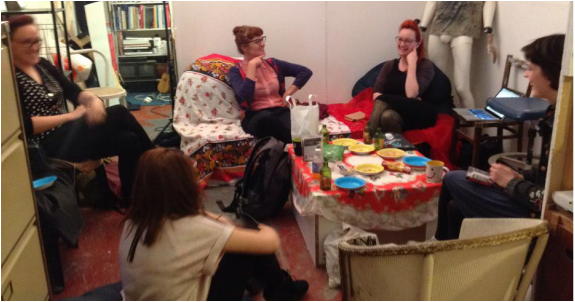 This opened up the conversation and others joined in, sharing their experiences of applying to open call submissions and how they deal with galleries and festivals. 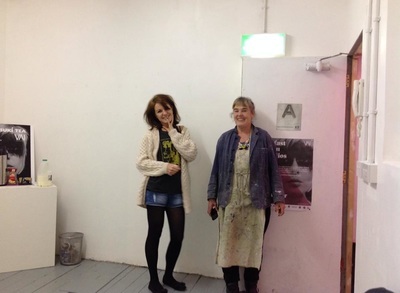 It also led to Fiona Goggin giving Jane an old window frame (a material Jane is working with at the minute) that she was clearing out from her studio before her move to Conway Mill Studios. This type of exchange and sharing is exactly what I hoped for with the Salon. Gracie McMurray (retired admin-queen and associate member of Array) chose to share a passage from a book she was reading, Theatre by David Mamet. The passage addresses systems of class and audiences of the theatre and lead us to a conversation about galleries in Belfast, art and performance audiences and the experience of viewing art in galleries and non-gallery locations. Studio member Clodagh Lavelle spoke about her practice and her need to produce new work for every show, with common themes running through each piece but her compulsion to push her practice through materials and audience experience. Jiann Hughes generously talked about her art practice and research that explores relationships between technology and the human body. 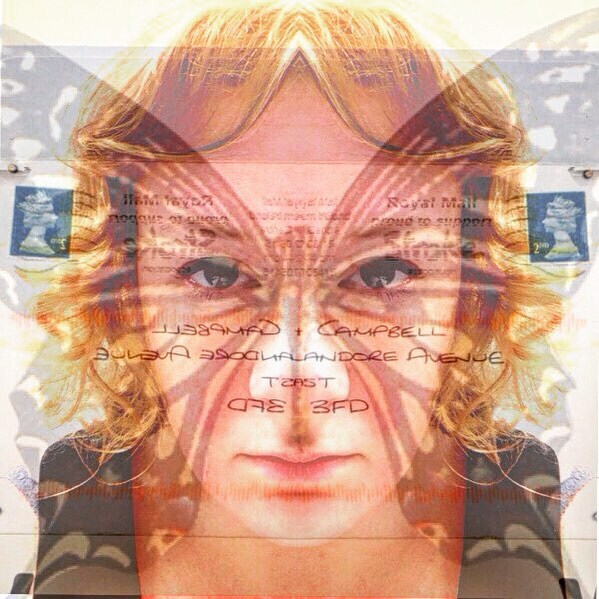 Combining biofeedback technology and performance in her work Jiann creates interactive installations that have been exhibited on the street and in formal/gallery settings. Laura O’Connor (me) decided to present a couple of sculpture pieces I had been working on. Usually working in the realm of video and performance and that being the focus of my PhD research I find myself returning sometimes to my sculptural background, which I see as some kind of therapy, or a break away from the everyday practice. It was great to get some feedback from the group, especially with work that is removed from what I normally produce. 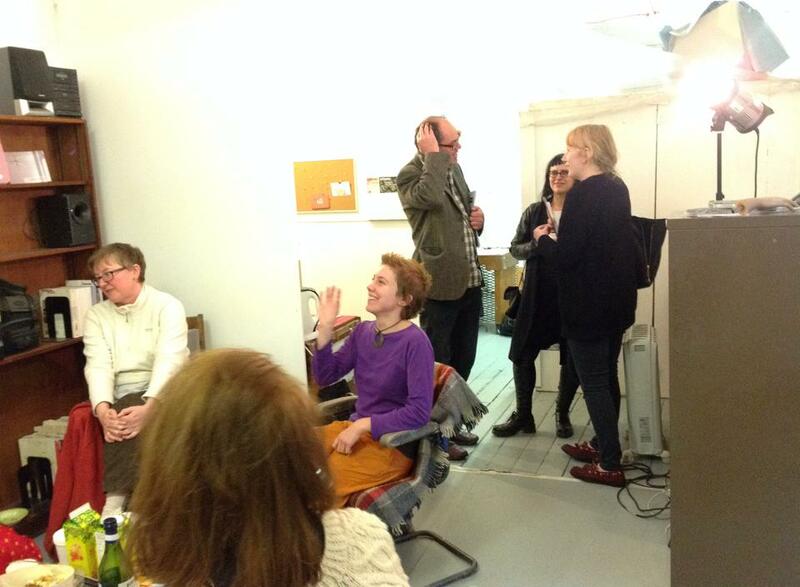 All in all, the Salon was a great success; we finished up at around 7pm with a quiet group wanting to retire early. 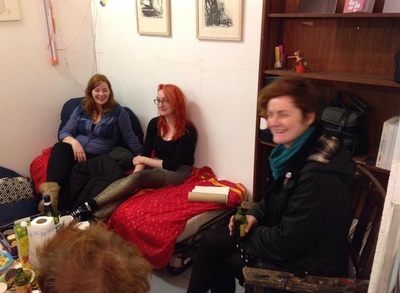 What we have established is a space where artists can come with ideas, questions, work, or a general interest in chatting to other artists and I see this as something that is important to us creative folk- a space that is not the bar or a busy opening night or a formal presentation of your work. 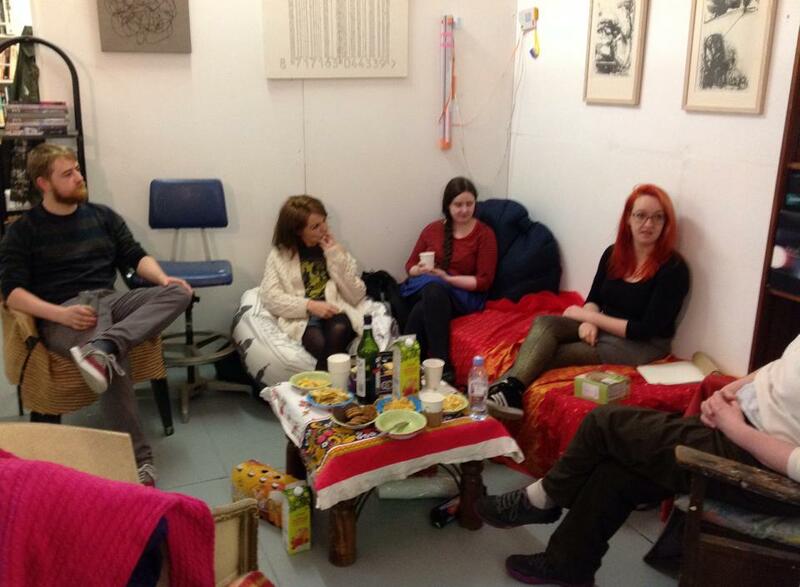 With the Belfast Open Studios happening on the last weekend in October we felt it would be good to hold the next Sunday Salon on the 26th of October, hopefully it will attract newbies to enrich and transform the dynamic in exciting new ways! !